The LeMay Family Collection grew out of the automotive obsession of one man, Harold LeMay. He grew up as a humble farm boy, served in World War II, then returned to Tacoma to start what became one of the largest privately owned rubbish-hauling companies in the country. When his collection topped 3,000 vehicles, it was listed in the Guinness Book of Records as the world’s “Largest Antique and Vintage Vehicle Collection.” The museum sprawls across the former home of the Marymount Military Academy, with cars and memorabilia tucked into every possible corner, including the former showers and indoor rifle range. Tours of several of the buildings are led by knowledgeable volunteers who are passionate about cars. One of the things that make the LeMay Family Collection unique is its wide range of vehicles on display. Tucked in between the showstoppers are ordinary cars from yesteryear; it’s almost like walking across a supermarket parking lot around the year 1972. The collection doesn’t stop at cars; there are also fire trucks, wreckers, tractors, and buses on display. In the White Building, vehicles are stacked in so tightly that some are on three-tiered racks. Despite the inconvenience of displaying them, they are exchanged frequently with hundreds of cars in off-site storage so those can be seen, too. A Soviet-built 1974 Gaz Chaika Limousine sits next to a U.S.-made 1955 Packard on which it was modeled, highlighting the progress (or lack thereof) of the Soviet automotive industry. The Chaika was so out of style that it’s probably the only 1970s car that sported tail fins. The 1948 Tucker has a special story: It’s the one car that always got away from Harold LeMay. In a closing of the circle, his family purchased it after his death. I’m always trying to find my first car, a 1975 Pontiac Firebird, in a museum. Here they had a ’74 and a ’76, so that was close enough to relive my glory days. TV/film cars include a 1969 Charger “General Lee” from The Dukes of Hazzard; the 1948 DeSoto Suburban Sedan that was the Cunningham family car on Happy Days; and a 1986 Cadillac Brougham that was used as a presidential limo in The American President and In the Line of Fire. A special event occurs on the last Saturday in August, when shuttle buses take visitors a few miles to the LeMay family home; there, another 200+(!) vehicles are on display. Believe it or not, the family is still adding to the collection. NAAM member. To see more autos that were owned by LeMay, visit the LeMay-America’s Car Museum that was created with a sizable gift of cars from the LeMay family. Number of vehicles: 500+ Highlights: 1948 Tucker (#7 of 51); 1959 Opel P-1 that set a record for 376 mpg (that’s miles per gallon, not mph); 1976 Chevrolet Vega Cosworth; 1938 Graham Custom 97. Note: For more about the Opel, go to www.376mpg.com. Location: 325 152nd Street, Tacoma, WA 98445. About eight miles south of LeMay–America’s Car Museum. Hours: Tuesday through Saturday, 10 a.m. to 5 p.m. Regularly scheduled tours of about two hours run throughout the day. 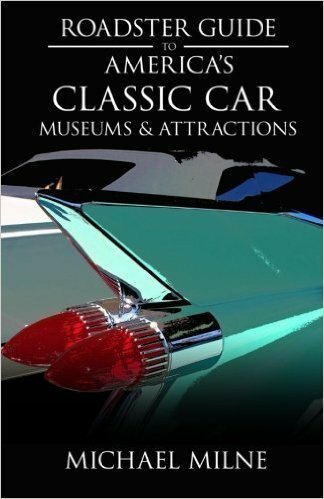 Here’s the link for more stories about classic car museums.